“Un-Cruise” on the Columbia River. Between them, the states of Oregon and Washington have about 1500 active wineries. Sadly, our Columbia River cruise could visit but a fraction of them. In Europe, river cruises are especially popular along the Danube, Rhine, Rhone and Seine, largely because of the scenery and access to some of the best vineyards and wines in the world. But here in North America, a cruise along the Columbia and three of its tributaries offers scenery that’s equally stunning plus the chance to visit New World wineries that produce red, white and rosé varieties that are winning many international awards. Up to now, few cruise ships ply the Columbia. But more should, because it’s spectacular. Our cruise was called “Four Rivers of Wine and History” and was run by Un-Cruise Adventures, a 20 year old company formerly known as American Safari Cruises. Now with a fleet of nine small, expedition ships, its wine cruise sails round-trip from Portland, Oregon, on the 88 passenger replica coastal steamer, S.S. Legacy. Built 30 years ago, Legacy has 1890s period décor. The staterooms are small but the level of comfort and service is high. Rooms open onto a walk-around deck and keys are not issued (the line says there’s never been a problem). The Un-Cruise all-inclusive policy provides extensive excursions, an open bar, excellent wines with meals and outstanding dining. Portland, known as “The City of Roses”, was an excellent starting point. We came a day early and stayed at the Lucia, an art-filled boutique hotel close to many top attractions. The Lucia hotel restaurant, Imperial, where we enjoyed two meals, is run by Vitaly Paley, a James Beard Award-wining chef. The next day we were greeted by Captain Scott and his crew as we boarded the S.S. Legacy, berthed elegantly along the Willamette River, one of the three Columbia tributaries on our route. Among the guests was Tim Jacox, the President and COO of Un-Cruise Adventures. He told us that the company specializes in small ships (ranging between 22 and 88 guests), exotic locations (Galapagos, Alaska, Sea of Cortez, Costa Rica) and an intense, in-depth experience for guests. The usual demographic age was between 45 and 65 but, on our cruise, it was a bit older. The geography on our route was remarkable, beginning with rain forest conditions on the Pacific side of the Cascade Mountain Range, then changing to high, eroded cliffs and desert-like conditions to the east of the Cascades. 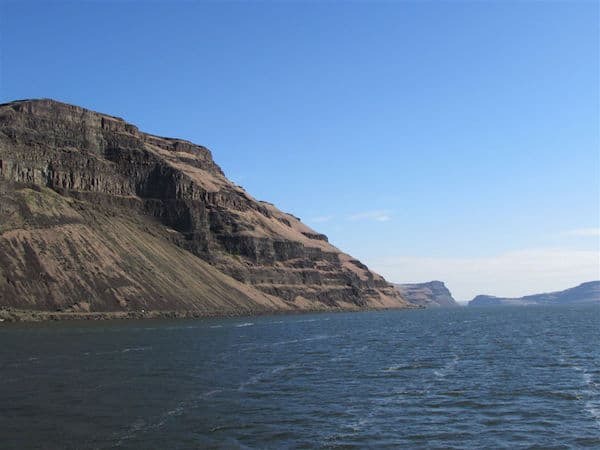 Our expert guides told us about the Columbia River Gorge and the cataclysmic floods that occurred periodically during the last ice age between 13,000 and 18,000 years ago. Ice blocked the river, built up Lake Missoula behind it (holding more water than Lakes Erie and Ontario combined), then collapsed, releasing a massive torrent that sculpted the land, tore away volcanic bedrock and left behind rich silt, ideal for growing grapes. Ice re-formed and the process was repeated several times. Formerly flooded areas along the Columbia and Snake Rivers have benefited as grape growers discovered the ideal soil, gravel (to stress the vines) and climate for world-class vintages. Our in-house sommelier, Chris Arora, told us about the many wines and wineries we would encounter during our week on the rivers and also chose the excellent wines we enjoyed with dinner on the ship (including a wonderful dessert wine each night). He also introduced a Washington State winemaker, Casey Cobble, from award-winning Robert Ramsay Cellars. She joined us for the whole cruise. Our first stop was a not a winery, but spectacular Multnomah Falls (620 feet high), the tallest in Oregon. Then we had to traverse a lock at the Bonneville Dam power station before a tasting visit (the first of many) to Springhouse Cellars and the Mount Hood Winery, both in the shadow of Oregon’s tallest peak, the “potentially active” Mount Hood. Volcanic soil produces outstanding Pinot Noir and Pinot Gris. After steaming through the Columbia River Gorge and its stark, sculpted walls we boarded a bus for Walla Walla, Washington, considered one of the ten best wine regions in the world. With 120 wineries and 1600 acres under cultivation, it produces rich, flavorful Cabernet Sauvignon, Merlot, Riesling and Syrah and several other varieties that win many international awards. We visited two major wineries, Basel Cellars and Castillo de Feliciana as well as three up-and-comers at “The Incubator”, a community launching site for new wineries. The next day we took a short detour up the Palouse River, then a bus to Palouse Falls State Park and what looked like a mini-Grand Canyon. More evidence of the severe Ice Age flooding. Returning down the Columbia River, we stopped in the exclusive Red Mountain Viticultural Area and the large Terra Blanca Estate Winery, acclaimed for its reds, especially Cabs, Merlot, Sangiovese and Syrah. During harvest, they process 500 tons of grapes a day. A tour, tasting of the best wines and a fine lunch were highlights. Wine and art were on our mind as Day 6 approached. Overlooking the Columbia River Gorge on the Washington side of the river, we visited the Maryhill Museum, built for the wife of entrepreneur and road builder Sam Hill, thought by some to be the origin of the expression, “What the Sam Hill?” The Beaux Arts style mansion was begun in 1914 but Sam Hill’s wife refused to relocate to such a remote area so Hill turned the palace into an art museum, featuring sculptures by Auguste Rodin, personal items from Queen Marie of Romania, many American and European works of art and more than 300 unique chess sets. A very unusual museum in an unusual place. Wineries were also on our agenda and we enjoyed some wonderful vintages from Maryhill Winery (close by the mansion) and, in the nearby town of The Dalles, Oregon, the Sunshine Mill Winery, site of a former grain mill. On our final day, S.S. Legacy sailed to the wide mouth of the Columbia River and the charming seaside city of Astoria, Oregon. We took a bus to the picturesque village of Cannon Beach and its signature Haystack Rock, rising 235 feet above the wide, sandy beach that faces the pounding Pacific. Back in Astoria, the ship docked next to the extensive Columbia River Maritime Museum, dedicated to the history of ships, shipping and related industries like salmon canning. Back on the ship, we had another wine tasting and lecture (now a pre-dinner tradition at 5:00 pm), followed by the Captain’s Dinner (filet minion and fresh halibut) and many toasts to an excellent cruise. We decided to spend an extra day in Portland, especially to visit the very creative Oregon Museum of Science and Industry. It’s particularly interesting for kids with its many hands-on demonstrations about physics, chemistry and technology, including a special exhibit about the history of video games. There’s also a planetarium, a giant IMAX 3D theatre and even a submarine tour. Our final night in Portland was at a most interesting location, The Nines Hotel. In addition to very comfortable and spacious rooms and an excellent Pan-Asian dining room, Departure, the lower stories of the block-wide building house a Macy’s Department Store. So excellent shopping was just an elevator ride away. And, as a bonus, Oregon has no sales tax! Disclosure: The Nowlans “Four Rivers and of Wine and History” cruise and visit to Portland, Oregon was sponsored by Un-Cruise Adventures and Travel Portland but any opinions expressed in this post are their own. Read about our colleague Janice Mucalov’s Hawaii Un-Cruise adventure on: SandInMySuitcase.com. Spare me the towel animals: What makes a good cabin steward? The scenery in Palouse State Park Canyon looks stunning! So we want to know if the food was totally awesome on this Columbia River cruise? On our Un-Cruise Adventures trips, the food (tasting very home-made) was exceptionally good. The food was incredible at every meal! I am still working it off! Irene S. Levine wins second-place SATW award!